The Triple Trainer is essentially a Functional Trainer times three. It packs all of the benefits of the Functional Trainer into a space-saving, triangular-shaped column, which can accommodate up to three exercisers at one time. Today�s gyms are incorporating areas dedicated to cable and functional training protocols, where multiple machines are required to service the needs of customers. 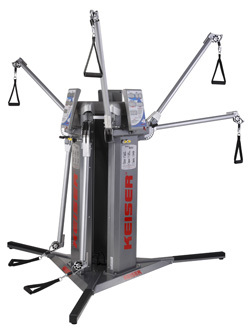 Like the Functional Trainer, the Triple Trainer performs an unlimited number of exercises, ensuring maximum versatility. Even exercises requiring a great deal of agility (as in sport specific training) can be done with ease.